This form is collected at São Félix do Xingu and is known as 'L081n' or 'L081 stardust'. Known only from the Rio Xingu watershed, Pará state, Brazil, but conflicting reports exist as to where it originates from. While some state it’s collected from close to the river’s confluence with the Amazon, near the town of Porto de Moz, others refer to localities ‘south of Altamira’ or at São Félix do Xingu, which places the collection points much further upstream, and overlapping the range of the very similar-looking congener B. xanthellus (see ‘Notes’). This can be further furnished with driftwood branches, roots and tough aquatic plants such as Microsorum, Bolbitis, or Anubias spp., which can be grown attached to the décor. Bright lighting will promote the growth of aufwuchs upon which the fish will graze. Like many species that naturally inhabit running waters it’s intolerant to the accumulation of organic wastes and requires spotless water at all times in order to thrive. 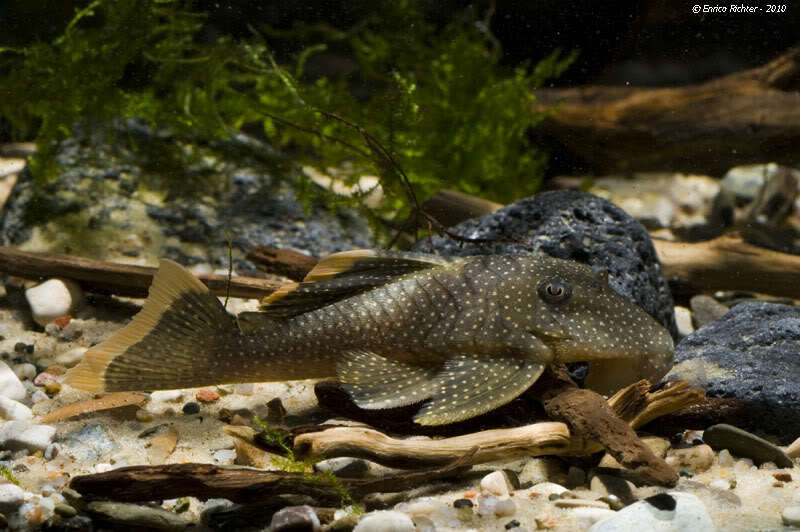 It’s also essential to provide sufficient levels of dissolved oxygen and water movement using a combination of canister filters, powerheads, etc., particularly if the aim is for the fish to breed. Weekly water changes of 40-70% should also be considered mandatory. Gut analyses of wild specimens of B. xanthellus revealed the diet to be composed chiefly of algae, particularly diatoms and filamentous genera such as Spirogyra alongside smaller amounts of invertebrates such as chironomids and bryozoans. Home-made, gelatine-bound recipes containing a mixture of puréed fish food, shellfish, fruit, and vegetables, are also proven to work well and in many ways represent the ideal staple diet since the ingredients can be altered at will, and when made well such foods contain a greater concentration and diversity of nutrients than any of the other options. Juveniles are relatively peaceful but males in particular become highly intolerant of conspecifics as they age and typically aggressive towards any other fish viewed as a territorial threat. It’s therefore best kept with species that inhabit other areas of the tank with medium-to-large sized characids particularly suitable. In very large aquaria you may be able to combine it with other catfishes or maintain a group provided care is taken to provide sufficient territorial space and visual barriers when laying out the décor. 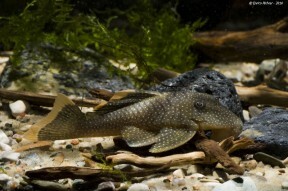 Adult males develop a broader, slightly flatter head profile and longer pectoral-fin spines than females. May only have been achieved on a single occasion, with any successful attempt likely to require a very large tank, well-oxygenated water and an excellent diet. 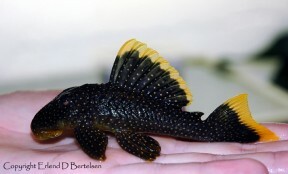 It remains unconfirmed as to whether this fish represents a colour form of B. xanthellus or not since its DATZ code number of L081 is not referred to in the description paper whereas all other codes for ‘gold nugget’ plecos, i.e., L018, L085, L177, plus the ‘Das Aquarium’ code LDA060 are mentioned. While it does appear different to the other forms, in that the spots on the body are noticeably smaller, the authors of the B. xanthellus paper note ‘considerable variation in density and size of spots’ between individuals. In addition, one of the specimens in our images was collected at São Félix do Xingu which is significantly upstream of any B. xanthellus locality; this form possesses very fine spots on the body and has been referred to as ‘L081n’ or ‘L081 stardust’. The sucking disc formed by the mouthparts is common to all representatives but both oral and dental morphology are highly variable depending on a given species‘ ecological adaptation(s), and some even practice xylophagy (wood-eating). Many are also facultative air-breathers, i.e., they possess the ability to respire atmospheric air if necessary.